In great demand as a pianist, Hakan Rydin has performed with among others Thad Jones, Pepper Adams, Red Mitchell, Etta Cameron, Enrico Rava and Dave Liebman. The Edmonton Journal (Canada) described his style as "lyrical and cooking." The still ongoing collaboration with American singer Kim Parker began in 1988 with a tour in Sweden and since then they have performed in all the Scandinavian countries as well as in France, Spain, Italy, Ireland, USA and Canada. He was an original member of the Swidish legendary group Nexus. 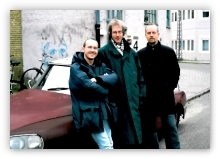 Shortly after the group was dissolved after 20 years in 1994, he put together the curren trio with Hans Andersson and Magan Hoglund. The trio has toured in Canada, all over Scandinavia and in the Baltic States with Kim Parker. Their first CD "Beautiful Friendship," recorded for Four Leaf Records in 1996, has been very well appreciated and is released in more than 10 countries. Hakan Rydin is professor of piano at the Malmo Academy of Music, Sweden. His students include Jan Lundgren, another fabulous pianist featured by Marshmallow Records.